We offer two portable HEPA filters with carbon filtration, which are made specifically for home bar/cigar room use. These portable and cost-effective units will efficiently remove tobacco smoke from the air while filtering out the smelly odors. 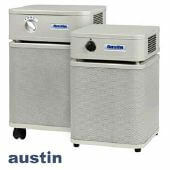 Smokeeter® (pronounced "Smoke-Eater") is the number one name in commercial air cleaners. It is specifically designed to handle tobacco smoke removal applications. We also offer Healthmate residential air cleaners from Austin Air that are specifically designed for tobacco use in residential spaces.